The Dark World Map is Here! Finally, the long-promised map of Dark World is ready for prime time. 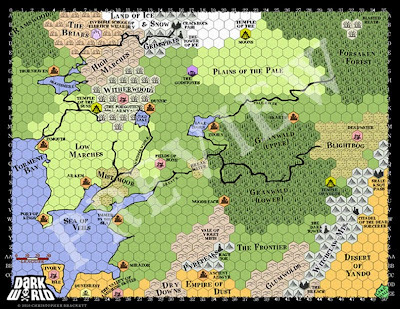 2) Purchase an 11" x 8.5" 150dpi electronic version (PDF) of the map via Lulu.com. *I hope I'm not offending anybody by going commercial. Everything else I have on this blog is free, and I plan to keep it that way. But, like many other decent folks, I find myself in dire straits, financially speaking. By buying one of these hi-res copies, you'll be helping me more than you know - and you'll be helping to ensure that the Rust Monster blog keeps rolling along. Very nice! I'll have to procure one. Excellent! How about sharing a "How I made it post" for those of us who are interested? I'm assuming Adobe Illustrator and symbols for the terrain bits. Details man.